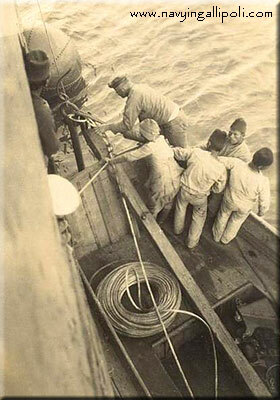 A German sailor assisted by the Turks lies a drifting mine. Officers and sailors of the Dardanelles mining unit. 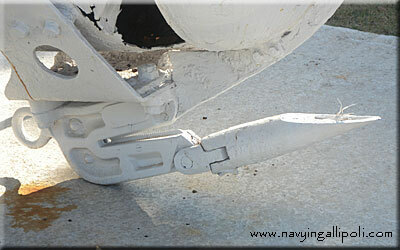 A Turkish made mine (the same as on the picture above) onboard of a minelayer in the Dardanelles. Note the fuses not installed yet. 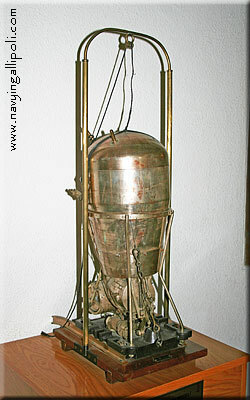 Remainings of the same mine in the Naval Museum in Çanakkale. 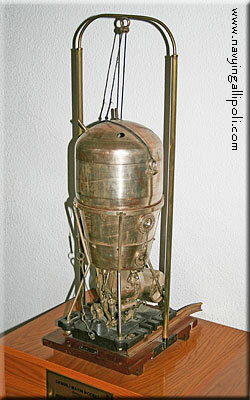 A model of the same type of mine in Beşiktaş Naval Museum, Istanbul. Note the fuse protection caps. 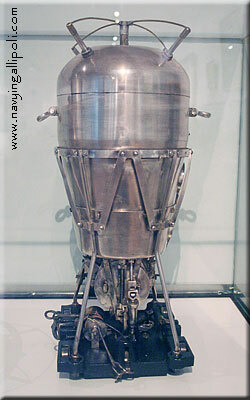 A model of the same type of mine in Harbiye War Museum, Istanbul. 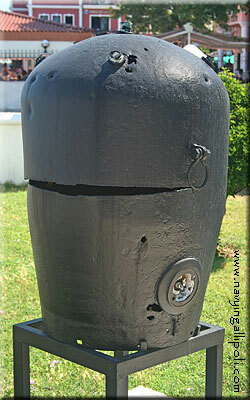 Remains of the English made mine in the Naval Museum in Çanakkale. 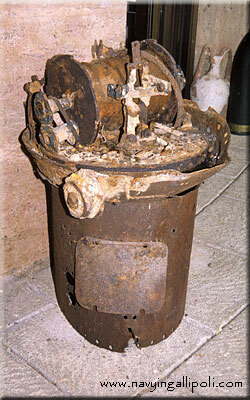 Remains of the same type of mine in Kabatepe War Museum on Gallipoli Peninsula. A German sketch published in “Deutsche Kriegs-Chronik des großen Völkerkampfes“. 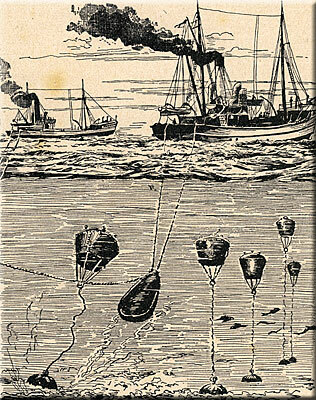 It shows a pair of English trawlers sweeping mines in the North Sea. 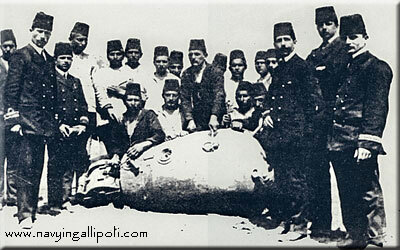 The very same vessels and sweeping technique were used in the Dardanelles. 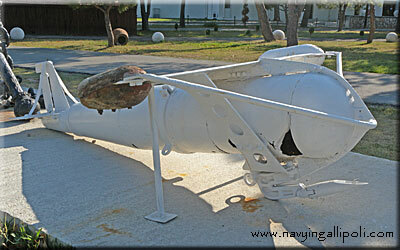 Naval Museum in Çanakkale. 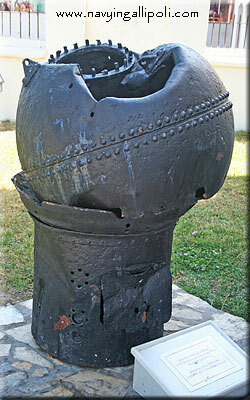 A British mine sweeping float found in the Dardanelles. Most probably it was lost on the night of March 13/14 by a minesweeper No. 705 and destroyer HMS Mosquito, when they tried to drag the anti-submarine net down the straits. 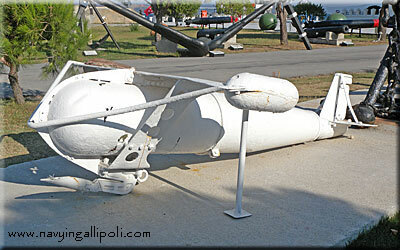 Naval Museum in Çanakkale. 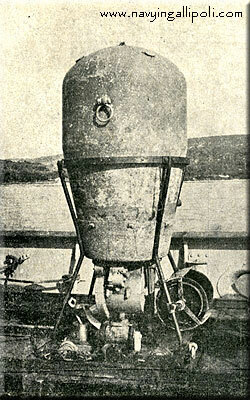 A British mine sweeping float found in the Dardanelles.